ALERT: Legislators decided late last week to add House Bill 25 to the special order calendar. They will vote on HB 25 either Wednesday or Thursday. 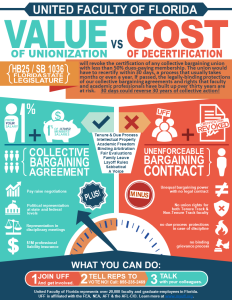 If this bill passes both chambers and becomes law, public unions under the 50% membership threshold could lose their certified collective bargaining agent status. The bill is an ugly partisan attack aimed at silencing the voices of Florida’s educators – while exempting police and firefighter unions. This bill is an attack on our rights. Take action today! 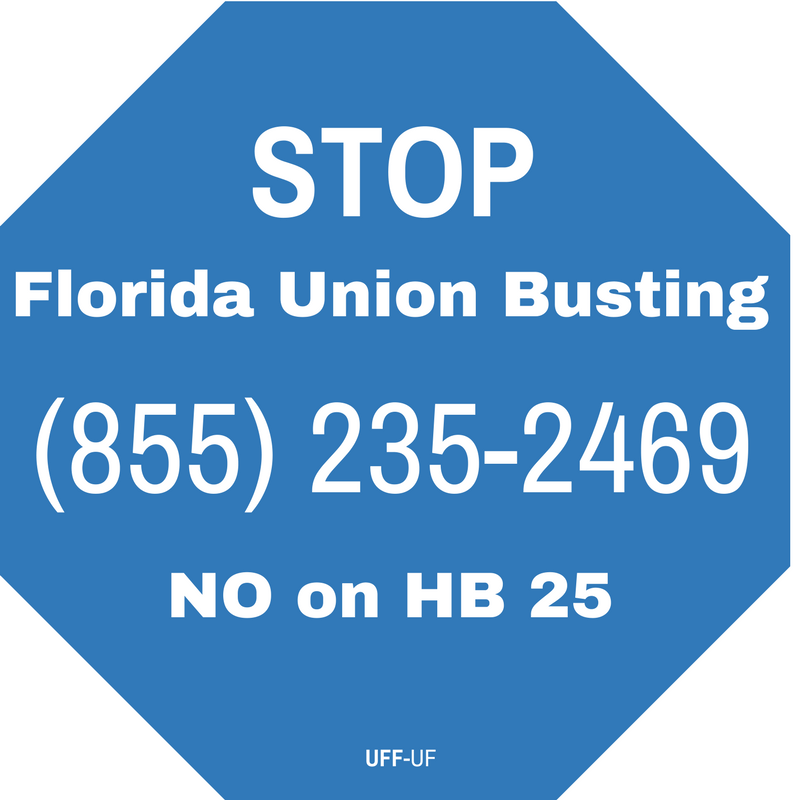 The right to organize and join a union is guaranteed in the Florida state constitution. However, Florida is a “right-to-work state,” which means that employees can choose to belong, or not, to the union that represents them during contract negotiations. 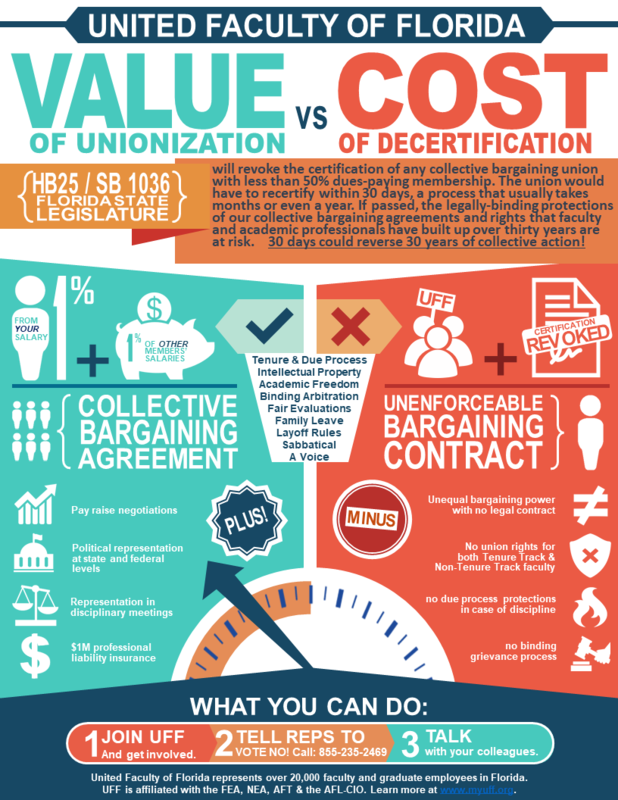 HB 25 would require all unions whose membership dips below 50% to recertify — that is, to hold a vote on whether or not employees want the union to represent them. The bill would drain the resources of unions by making them continuously campaign for enough dues-paying members — or risk being shut down. It is part of an ongoing national effort by the right-wing American Legislative Council (ALEC) and Americans for Prosperity, the Koch-funded conservative advocacy group, which is opposed to unions, public education, and worker justice. What are the arguments against this legislation? It is unnecessary. Unions are already transparent and democratic, and are held to strict laws ensuring accountability. Because we are in a “right-to-work” state, people can choose whether or not to pay dues—but that doesn’t mean they don’t support the union’s representation in contract negotiations and other matters. This bill directly interferes with our constitutionally guaranteed right to collective bargaining. It is a blatantly partisan attack on some unions that conservative lawmakers see as political opponents. While university, college, and K-12 faculty and staff would be affected, the bill specifically exempts unions that tend to side with conservative legislators, including police, firefighter, and corrections unions. Take action! From a non-work number, call (855) 235-2469 and enter your zip code NOW to be connected with your local state representative. You can also email your representative by clicking here: FEA Action Center. Talk to your colleagues about HB 25. 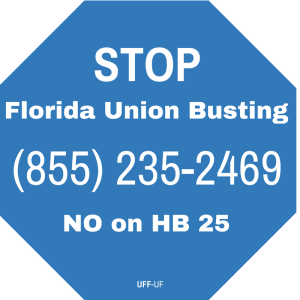 If it does pass into law, we will need your help to recertify UFF as our bargaining agent. Even if they are not willing to become members, many of our colleagues value the protections of a legally binding contract that UFF provides them.